ZombieKeys, although originally written to be keyboard only, now has finally got a nice interface which makes it easier to use, especially for those who work with it for the first time. 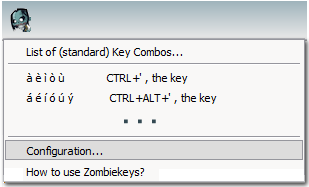 To switch the layout for using different shortcuts, select the "Configuration..." item from the Zombiekey menu. This will display the configuration screen, which is currently just a selection for the language layout with a screenshot. Just select a language and click Ok (Close). You might have to restart Thunderbird / Firefox / Mozilla to fully activate the layout, as some parts of the UI are configured via XML and I currently have no way of influencing them directly. 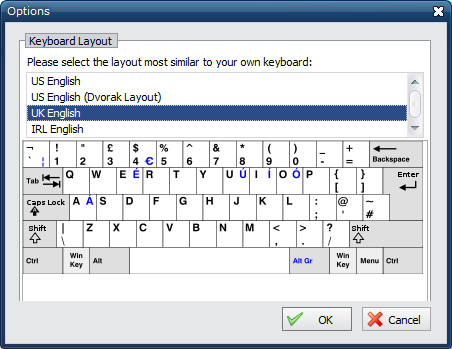 Attribution: the images for these layouts come from http://en.wikipedia.org/wiki/Keyboard_layout and are submitted to the licenses that are listed there. Please attribute them if you are going to use them in your own works / derivatives. Click here for some diagrams that show the actual country specific shortcuts. 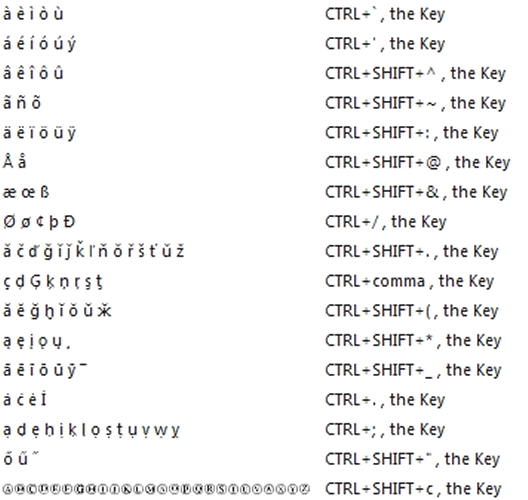 Most of these were "mined" from the totally awesome Unicode Search at Fileformat.info. 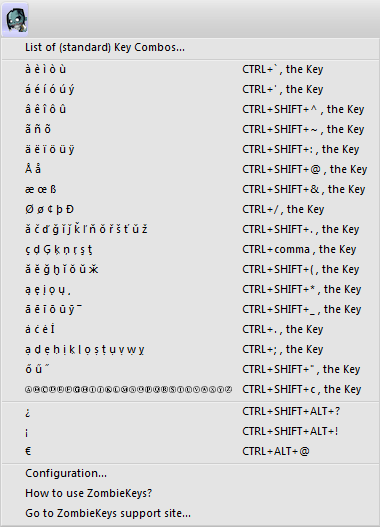 This is a very valuable resource if you ever have to do anything exhaustive with special characters within the Unicode character set. Be aware that a lot of cheap fonts do _not_ support displaying these characters correctly, it has to be a fully Unicode compliant font, such as Arial. Older versions can be downloaded here, although I do not recommend it; you can also download some of the pre-releases which fix ongoing problems and tryout new features - no warranties that features will be the same in the release version. Some of these might also be on bugzilla as patches. I usually fix bugs fairly quickly but you might find some of these buggy - you have been warned. Does not show donation tab when updating anymore. Mozilla is going to eventually terminate XUL based addons, so it is important that our functionality stays supported on this Firefox fork. Here is a Mozilla blog post explaining their plans. There are also some changes planned around a new programming model called Electrolysis (e10s) which may break functionality of addons that try to insert content into any browser tab. It may become the standard in a near future release of Firefox and would also affect Zombiekeys. Please consider donating to help developing e10s compatibility for the future of Firefox. [Bug 26199] Add support for ŵ and ŷ - apparently these characters are used in Welsh a lot. [Bug 25979] Toolbar Icon returns after being removed. Firefox: CTRL + ` key close the current tab. Fixed in Irish keyboard layout. Known issue: Apparently there is still a problem with Iceweasel 38.7 under Linux - when pressing CTRL+ the ` key, it sets charCode (39) instead of keyCode (190). Hopefully future support for custom layouts may fix the issue. [Bug 25202] Reopened - Fixed Acute for IRL / UK keyboards. fixed [bug 24735]: In Gmail Compose Mail window shortcuts do not work, this affects Fx10+. This bugfix apparently also works for Thunderbird 10's compose window, which was affected by the same bug. stability fixes for inserting into nodes that have no selectionStart etc. In the search box (only), Zombiekey letters are put in the wrong position. So far no idea why? Adds compatibility to Firefox 4 and Postbox 2.1. I (Axel Grude) joined the development team and started to take over administration for the ZombieKeys project which was handled by Kai Bolay up to this date. QuickFolders (Thunderbird / Postbox) takes the pain out of working with many mail folders; has currently 22,000 daily users and is the top rated message reading extension.